Chair 14 is also known as the “Chair of Chairs”. 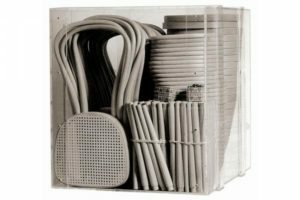 Designed in 1859, by the German-Austrian cabinet maker Michael Thonet, it is an enduring design classic and it is belived to be the very first product of modern industrial design. Thonet’s ability to produce lightweight and strong wood bent into curving, graceful shapes brought him enduring success with the aesthetics and function of design. Durable and comfortable, this practical chair provided a modern replacement and departure from the heavy, carved designs of furniture at the time. Simplicity and clean lines of perfection, indeed. 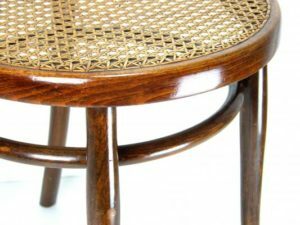 During the 1830’s Thonet began experimenting with furniture using glued and bent wooden slats. 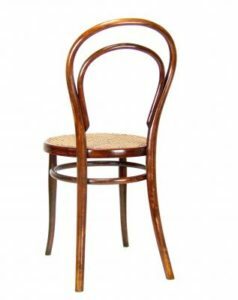 In 1836 Thonet successfully created a chair, the Boppard Layerwood Chair, a predecessor of the Bentwood Model 14 chair, using glue as a component. In fact, Thonet even went on to acquire a glue factory in 1837, which produced glue used for this process. During the World’s Fair 1851 in London, England, Thonet received the bronze medal for his ‘Vienna Bentwood Chairs’. Referred to as an international breakthrough, his fame continued and he was awarded the silver medal at the following World’s Fair of 1855, in Paris, France for his infamous No. 14 Chair. The Bentwood chair. 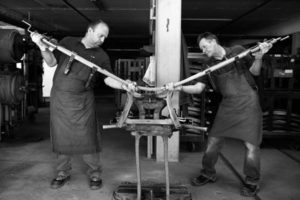 Production methods were improved and the demand for his chairs provided an opportunity to purchase a new factory in Korycany, Moravia in 1856. The 1859 chair Nr. 14, also known as the Konsumstuhl Nr. 14 or Coffee shop chair No. 14 is considered the “Chair of chairs”. In fact, it is said that over 50 million were produced up until 1930. It is stated that the Thonet Chair was the very first mass-produced chair. Who knew? 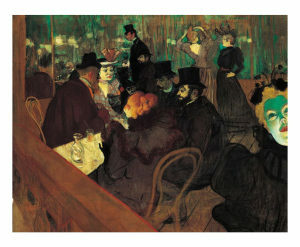 Iconic artists of the time, including Auguste Renoir and Toulouse Lautrec, both featured Thonet Chairs in their infamous paintings and drawings. Even Pablo Picasso possessed a Thonet chair in his studio. 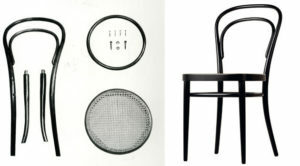 Often referred to the Bistro Chair or “Coffee House Chair”, it is said that the Thonet Chair has become the most influential design in the history of furniture. “At The Moulin Rouge”, Toulouse-Lautrec. With a simple aesthetic appeal, unfussy shape paired with a high level of functionality, it is no surprise that the lightweight and practical chair still commands our attention. Certainly, the understanding of the history of this innovative chair only adds to our appreciation of it. 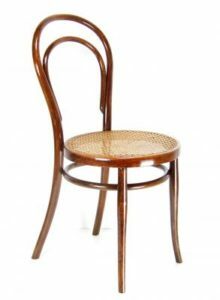 Consider Thonet’s Bentwood Chair. Considered a “Useable work of art” and a mainstay of modern design, these chairs can blend with so many diverse interior styles. Whether classic, traditional or modern in preference, this chair is a timeless classic, indeed. Efficient packing of Model 214 components. Of interest, the Model 14 Bentwood Chair consists of only six components paired with a few screws and nuts. 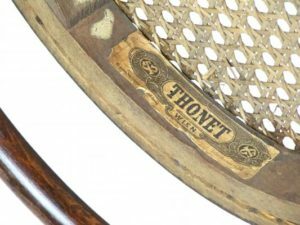 Initially,rejecting traditional methods and seeking more simple and economic means of production, Thonet used bent veneers glued together and held together in what is called “Jigs”. 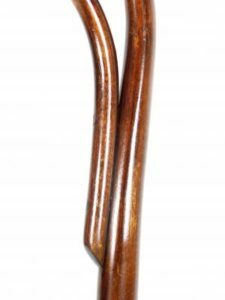 This had proved to be a labor intensive method, and in addition, the wood could only be bent in one direction. Adapting this method by additional cutting, twisting and ‘rasping’, Thonet was able to obtain 3-dimensional bends with oval sections. His search to eliminate the glue, which dissolved it hot, damp climates, led him to his revolutionary solution: a solid piece of steamed wood and a metal strap could be bent together without cracking the wood. When dry, the wood would retain the new shape. Thus, a stronger chair was made with less pieces, less joints and screws replacing the glue. In 1856, this modern and original process was patented by Thonet’s son, GebrA1/4der Thonet, and mass production ensued. The design has virtually remained unchanged for over 150 years. Classic and timeless, indeed. Steam bending wood in the Thonet workshop.